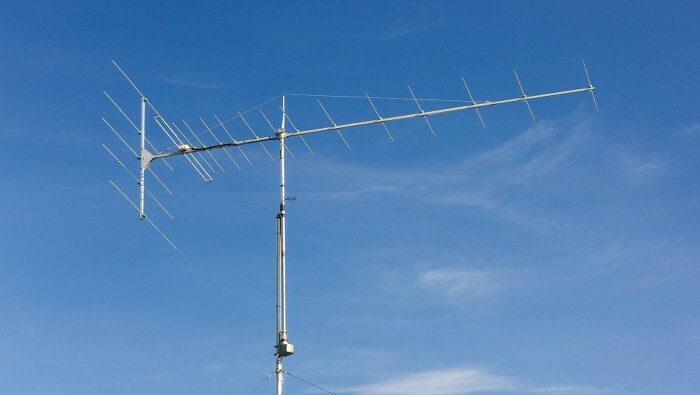 Peter Körner designed a 19-element Yagi for the 88-108 MHz FM broadcast band with a horizontal folded dipole and five reflectors. As the name suggests, this is the third version of this antenna, optimized to 9-11 dBd gain and F/R between 30–38 dB. The distance between first and last element is 5.1 m or 201″. I built this antenna in 2010 for FM-DX reception in a horizontal polarization. 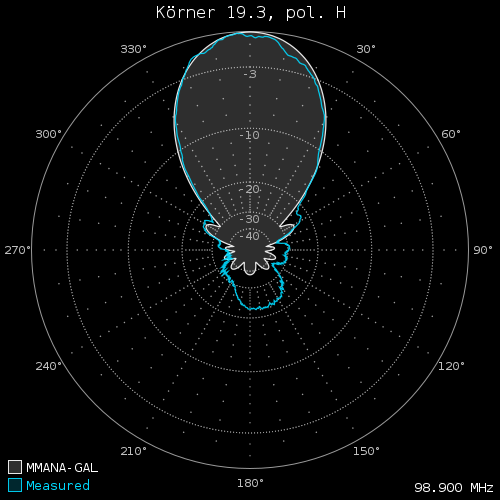 Brian Beezley, K6STI optimized the F/R ratio further, reaching at least 36 dB over entire bandwidth. See more information on his website – Optimized 19.3. Currently, another revision of 19-element Körner Yagi antenna is in development, featuring F/R ratio of around 40 dB. The pattern depends highly on a polarization, as this antenna uses a horizontal folded dipole. Its dimensions were optimized for horizontal polarization, when both arms are in parallel to the received signal. plastic box, cable glands, F-connectors, 75Ω coaxial cable. Each tube end should be closed. The water may freeze inside an element and break it during the wintertime. I used some teflon plugs for that. The main and reflector boom joint is made of two pieces of duraluminium sheets. The antenna boom is quite long, so it requires additional support. I used a nonconductive kevlar boom guys to keep the influence on the antenna’s pattern as lowest as possible. 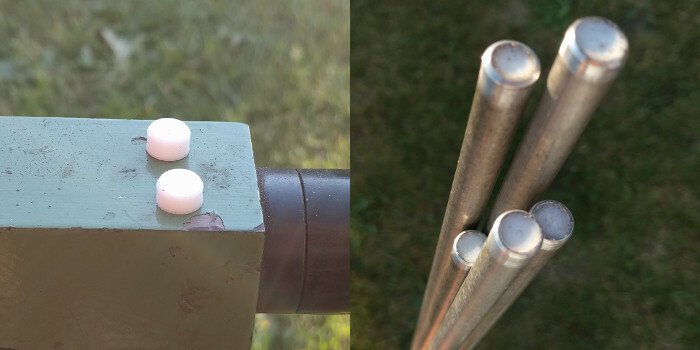 The dipole is made of 15×5 mm aluminium flat bars and ϕ15 mm tubing elements between dipole arm ends. Personally I used ϕ16×1.5 mm tubes, because 15 mm were unavailable at my nearby store. For the 300Ω → 75Ω matching I made a half-wave coaxial balun. All connections at the feedpoint are joined with special bi-metallic Cu/Al washers for long-term reliability. Additionally I used a spray dedicated for PCB coating to protect all connections. Before closing the box, I also sealed it with silicone. All antenna patterns were measured with a modified Sony XDR-F1HD tuner and XDR-GTK software. My AR-303 rotator is not very linear, especially towards north, where it starts and ends the rotation. The multipath interference is visible as a choppy signal on the following plots. I used some signal attentuators for the strongest stations. I also measured other weaker signals during maintenance of my local transmitter site, carrying 6x 60 kW + 1x 2.5 kW @ 35 km. Reflectors made with 10×1 mm aluminium tubes are the weakest part of this construction. Frequent vibrations weaken the material at element mounts – see this video. 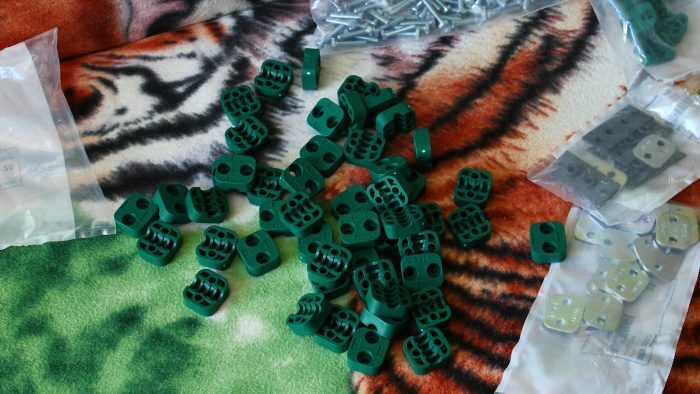 Use 10×2 mm instead or reinforce the thinner ones. 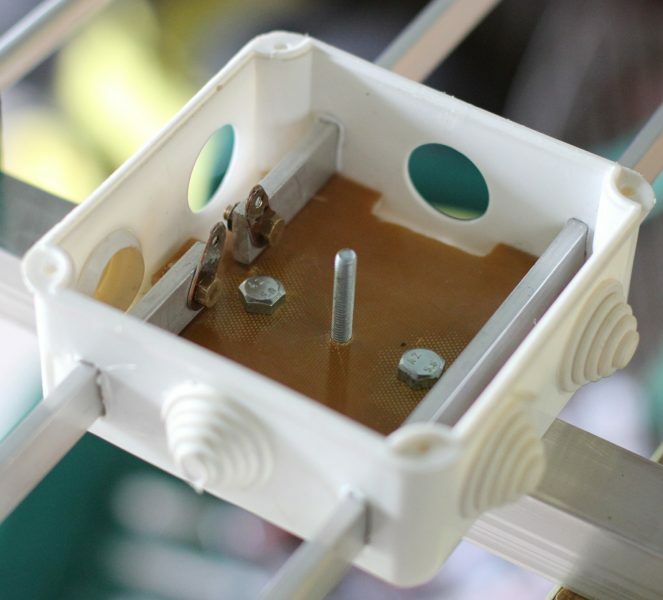 Read more: 2x 9-el Yagi detailed write-up. The rectangular folded dipole conductors cannot be sealed with a cable gland. After two years, when I put the antenna down for a maintenance, I found some signs of water corrosion. I filled the remaining space inside dipole box with a spray foam and sealed it again with silicone. It is (or should be) 100% waterproof now. Another idea is to build the dipole using ϕ11-12 mm tubes with cable glands, instead of the rectangular flat bars. Although the reception is much more propagation dependent than just the antenna, it is worth mentioning about real-world FM-DX results. …and many, many other stations which are listed in my DX log. 71.09 Radio Rossii – Stary Oskol, 17 kW ERP (?) – 69 dBf – out of band! Körner 19.3 is definitely one of the best 87.5-108 MHz antennas ever designed. Unfortunately, I cannot take full advantage of its superb F/R ratio due to strong multipath interference – metal roofs, high voltage lines and the worst – a nearby oil refinery with many chimneys and metal constructions. 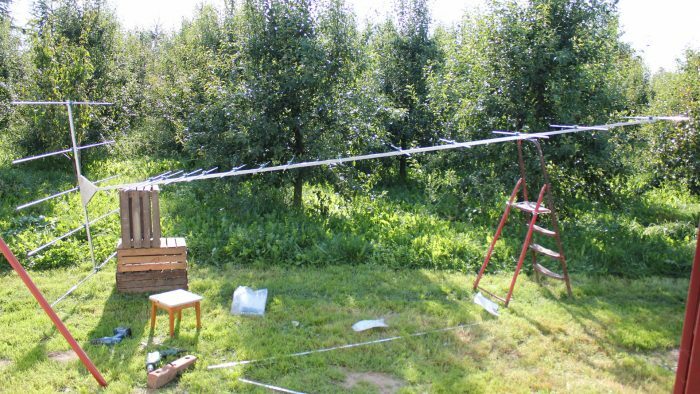 This antenna is also somewhat suitable on OIRT (66-74 MHz), as this frequency band is empty, so the F/R ratio is not very important. For the bottom of band (below 69-70 MHz) Körner 19.3 should be directed backwards, as the reflectors will act as a directors. For the top of band (above 69-70 MHz) it should be directed right ahead. The following video presents a full rotation of my Körner 19.3 recorded in August 2010. Currently, the antenna is installed on a higher mast – 10 m AGL, instead of 7.5 m (+ 114 m ASL).